White — This action folder contains those things you will take immediate action on. Red — Your fiscal folder holds all your bills, which need to be paid. 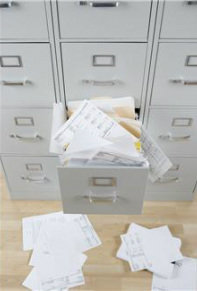 A calendar should be placed inside the folder so that you can see when a particular bill is due. Yellow — This pending folder is to put things on hold and you will eventually use but do not need to be filed away such as a wedding invitation directions, trash schedule, etc. Green — This filing folder is for all those items that should be filed away at a later date in your household file cabinet. Blue — The spouse folder is for correspondence relating to your spouse. Now the mail is in one uniform spot for him to read. Orange — The reading folder is for any mail that will take over ten minutes to read.